The Multifort Collection, originally introduced by MIDO in 1934 takes inspiration from the revolutionary architecture of Sydney Harbour Bridge. Opened in 1932, a true feat of engineering prowess, the Sydney Harbour Bridge perfectly embodies the era of the 1930s industrial revolution. 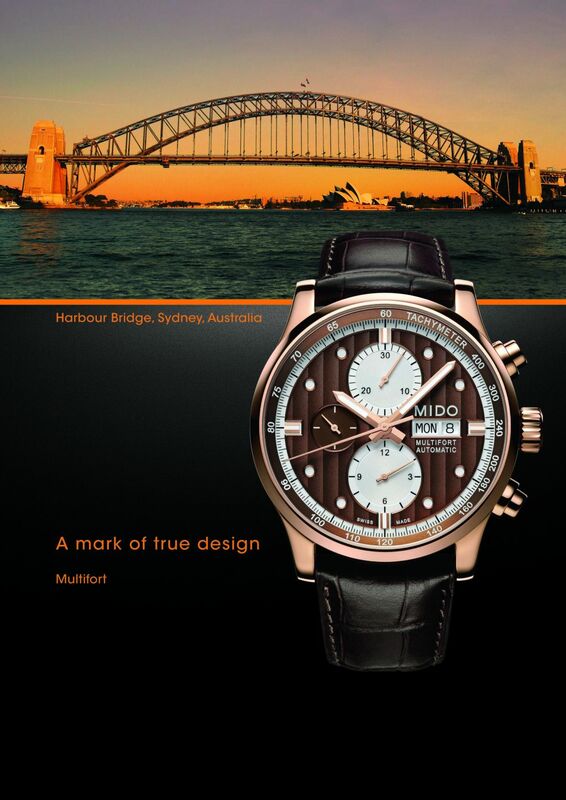 In 2012, MIDO enriches its Multifort Collection with a new sport chic automatic chronograph timepiece. Crafted in Stainless steel 316L case with rose PVD treatment and measuring a diameter of 44 mm, this chronograph is highly reliable and robust. Water-resistant up to a pressure of 10 bar (100 m / 330 ft), this timepiece has a transparent case back through which its owner can admire the finely decorated automatic movement. Finished in subtle shades of brown, the new Multifort offers sporty good looks. The case is finished in rose PVD. Encircled by a flange incorporating a tachymeter scale, the dial features vertical Geneva stripes decorations and is protected by a sapphire crystal. The two chronograph counters stand out by their large dimensions. The hour and minute hands and the indexes are treated with white Super-LumiNova® making it easy to tell the time, even at night. This model has a screw down crown. The Multifort is mounted on a brown leather strap. It is also available with a silver, anthracite or black dial mounted on a steel, leather or black rubber strap. 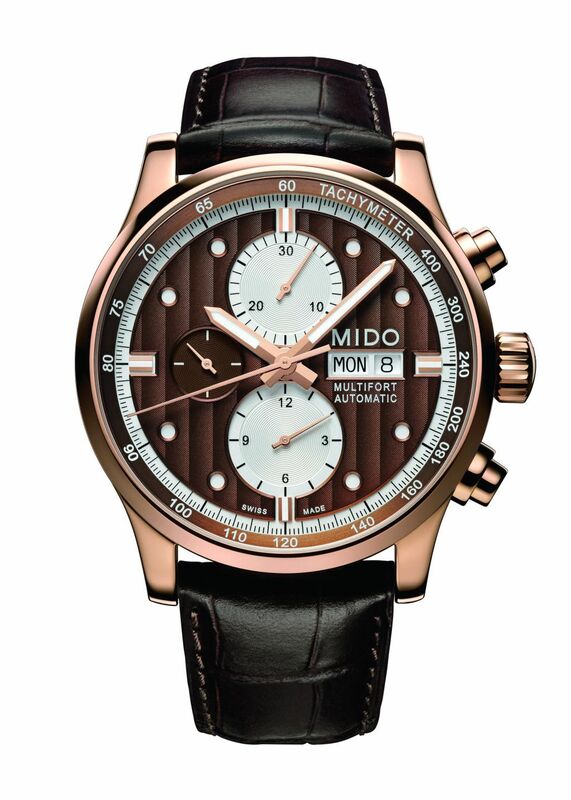 Automatic chronograph Mido 1320 (based on ETA Valjoux 7750), 13¼’’’ 30.00 mm, height 7.90 mm, 25 jewels, 28,800 A/H, INCABLOC and NIVACOURBE shock-absorber, gilt GLUCYDUR balance, ANACHRON balance-spring, NIVAFLEX NM mainspring. Finely decorated top movement with blued screws, circular-grained bars, decorated oscillating weight with Geneva stripes and engraved Mido logo. Adjusted on 5 different positions for a high accuracy. Min. 48 hours power reserve. – Time: hour and minute hands. Small second indicator at 9 o’clock. – Chrono: 60 second counter from centre, 30 minute counter at 12 o’clock and 12 hour counter at 6 o’clock. – Day and date at 3 o’clock. Stainless steel 316L with rose PVD treatment, 3 pieces, sapphire crystal, screwed crown and case back, transparent case back to see the finely decorated and top movement, engraved serial number, water-resistant up to a pressure of 10 bar (100 m / 330 ft). Brown, vertical Geneva stripes, indexes with white Super-LumiNova®, date at 3 o’clock. Hands: Hour and minute hands with white Super-LumiNova® for easy readability at night.